Like North America, Europe's flu season has arrived a little late this year, and while they haven't reported the level of activity that we've seen reported in Eastern Europe and Russia (see WHO: Update On Ukraine's Flu Season ), for many countries their season has yet to peak. Follow the link below for a variety of detailed charts and maps for Epi Week 6. Twenty-one of the 46 Member States that reported epidemiological data from surveillance for influenza-like illness (ILI) and acute respiratory infection (ARI) indicated increasing rates for week 06/2016; 37 countries reported influenza-virus detections in specimens from sentinel sources, indicating influenza activity in the WHO European Region as a whole. 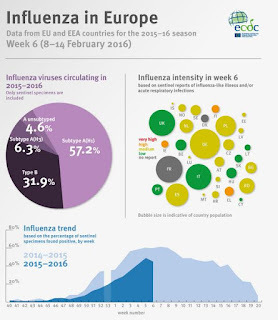 Belarus, Finland, Greece, Ireland and Switzerland indicated high-intensity influenza activity. Influenza activity in the Russian Federation and Ukraine declined from very high in week 05/2016 to medium for week 06/2016. A(H1N1)pdm09 viruses continue to predominate, accounting for 90% of subtyped influenza A viruses detected through sentinel surveillance. Cases of severe disease, mainly in people aged 15–64 years, increased again in week 06/2016, with most of them associated with A(H1N1)pdm09. So far, a predominance of influenza A(H1N1)pdm09 viruses has characterized the 2015–2016 influenza season in most countries in the Region; this virus subtype may cause more severe disease and deaths in adults aged 15–64 years than A(H3N2) viruses. 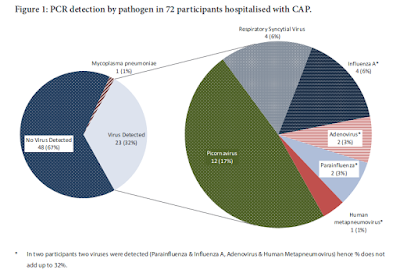 Since week 52/2015, several European countries with sentinel surveillance systems for severe acute respiratory infection (SARI) have reported increasing numbers of cases associated with A(H1N1)pdm09 infection. Similarly, countries reporting laboratory-confirmed influenza cases in hospitals and intensive care units (ICUs) have detected influenza A virus in the majority of cases since the start of the season, with A(H1N1)pdm09 being the dominant subtype. Most of the viruses characterized so far have been similar to the strains recommended for inclusion in this winter’s trivalent or quadrivalent vaccines for the northern hemisphere. Risk assessments for the season are available from the European Centre for Disease Prevention and Control (ECDC) and the WHO Regional Office for Europe. Additional information on influenza in the world is available from WHO’s global updates.